Moose Monday: In a Lake! You know what I have missed so dang much? Moose Monday! It has been a long time since I had seen a moose in Alaska and I was starting to think the big guys were hiding from me. When I was staying at Mount Aurora Lodge in Fairbanks, I took a day trip out to Chena Hot Springs. I was lucky to see a moose out in the lake! My first moose sighting in water!! I thought that she was salmon fishing, but nope, she was eating plants on the bottom of the lake. Who knew? I’ve also added a gallery of my moose pics below that I have taken so far. Which one is your favorite? 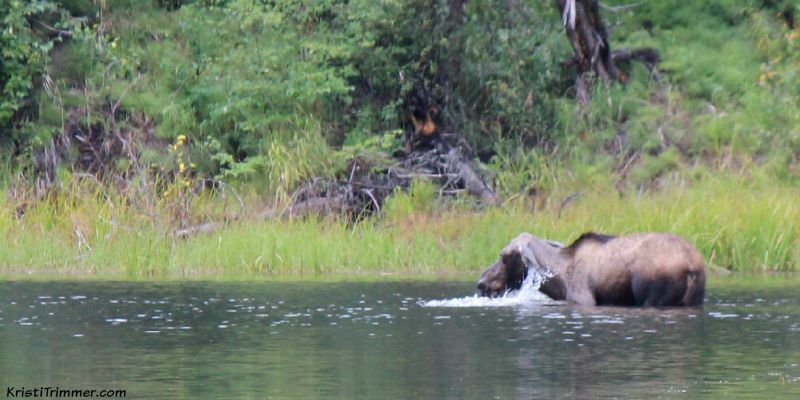 I thought this moose was salmon fishing, but she was eating plants on the bottom of the lake. She popped her head up and had plants in her mouth as the water dripped down her long, cuddly ears. You know I just wanted to cuddle her right up! 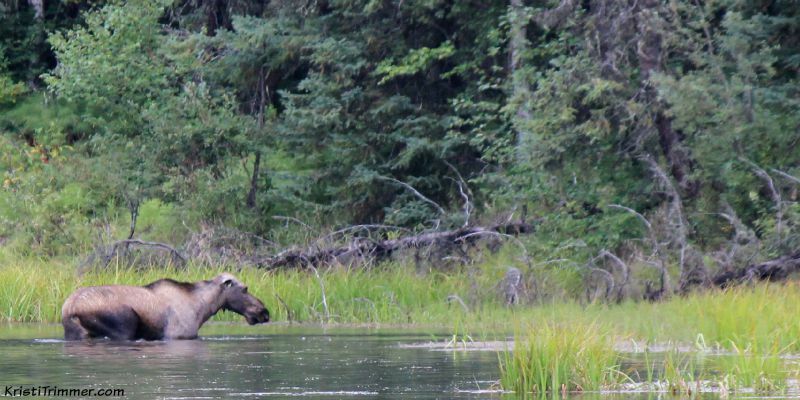 After her water plant salad, this cow moose went back to the sanctuary of the forest. how amazing! i would love to see something like that! I plan to take a trip to Alaska someday. I would love to experience that too. Alaska is on my bucket list, it is so beautiful!